Hey y'all! Quick recipe post today! I can't believe Christmas is only three weeks away - I'm being reasonably organised this year, and have already baked my Christmas cake (Nigel Slater's one from The Kitchen Diaries), and have even done most of my Christmas shopping! Crazy! But I just foresee it getting busier and busier as Christmas approaches - work, catching up with friends and family, and of course more Christmas baking and cooking. 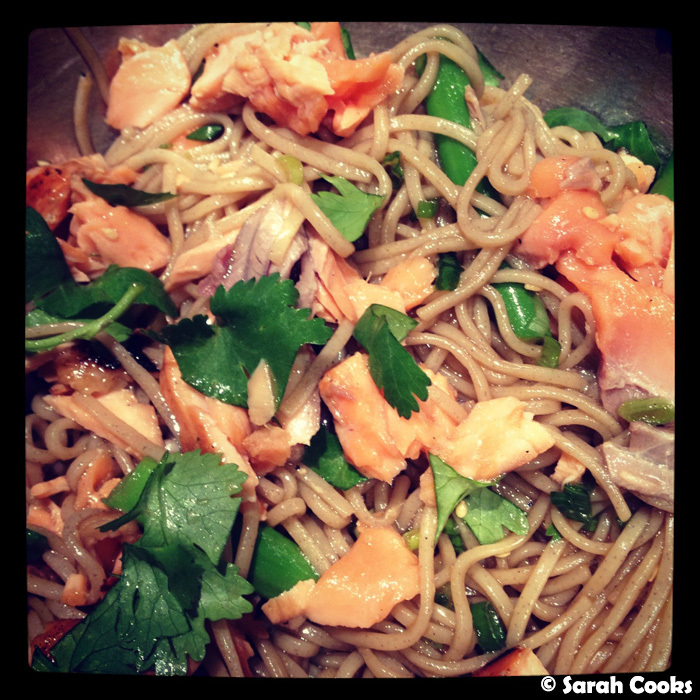 You marinate and then grill a piece of salmon, boil up the marinading liquid and use it to dress cooked soba noodles. 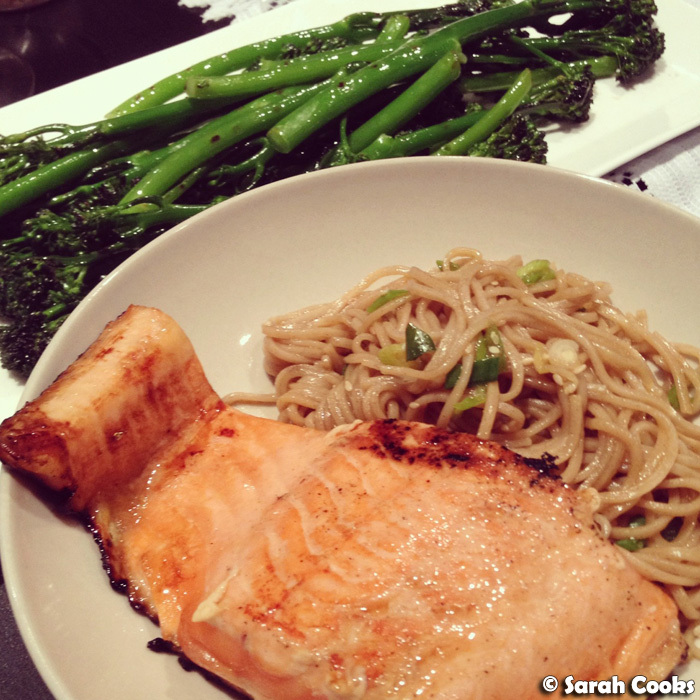 Blanched and grilled broccolini add extra deliciousness and vitamins. Full disclosure - you will end up with quite a few dishes, but I think it's worth it! And chargrilled broccolini is so, so tasty. You must try it! In lazier evenings, I've replaced the broccolini with spears of asparagus - just chucking them into cooking water with the soba for the last couple of minutes. Another good idea is to double the quantities, and have leftovers cold as a salad the next day (I'd suggest cooking the salmon all the way through if you're doing this). So good, and good for you! Enjoy. For the noodles: cook the soba noodles in rapidly boiling water for 5-7 minutes (or according to packet directions) until cooked but still retaining a bit of bite. Drain and rinse with cold water to arrest the cooking. For the salmon: mix together the honey, mirin, soy and sesame oil, pour over the salmon and allow to marinate for 5 minutes. Heat a little vegetable oil in non-stick pan over a medium heat, then fry the salmon for 2-3 minutes a side or until done to your liking. Allow to rest on a plate. Pour the marinade into the frypan and boil for 1 minute. Pour the cooked marinade over the soba, add toasted sesame seeds and chopped spring onions. Toss to mix. For the broccolini: cook the broccolini in rapidly boiling salted water for 2 minutes. Drain and run under cold water to arrest the cooking. Drizzle with olive oil and toss to coat. Cook on a super hot griddle pan for a minute or two each side until you get marks on the broccolini and it starts to smell amazing! Love soba like I do? Check out these recipes, from the old old days of this blog! Now I can't wait to try hehe I love love love salmon! and I've heard that soba is very healthy too woo hoo! Winston - I'm so glad you liked the recipe! I'm sure all the omega 3s in the salmon helped you during exams! :) I felt bad when you instagrammed that there were a lot of dishes (and yup, there were!) but I love the broccolini too much to leave it out of the recipe, hehe.